Registering your participants or attendees at your event is crucial. It enables you to buy in the correct amount of supplies (food, medals) and ensure you have sufficient provisions in terms of First Aid cover and waste disposal. Our registration systems are fully customisable to your event, can embed directly into your website or exist on their own unique URL (web address). If you need to take payments, then we will link the payment process directly with YOUR bank account to ensure you are always able to access your money! We have low set up and running costs which means you can pass on these savings to your participants. 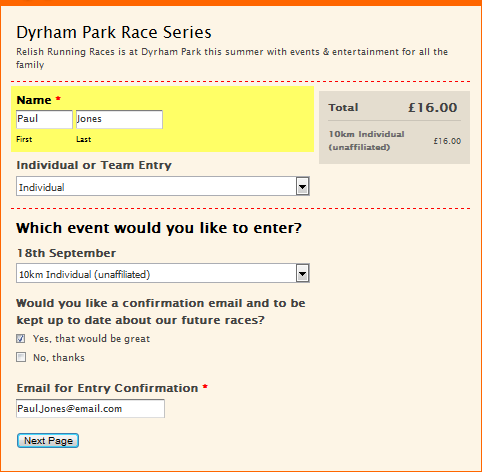 We are significantly cheaper than the large event registrations companies such as Runners World and Active, and our forms are more customisable which means you can offer more options to your participants including running Discount Codes, multi event registrations discounts and selling additional items such as t-shirts and other event mementos.